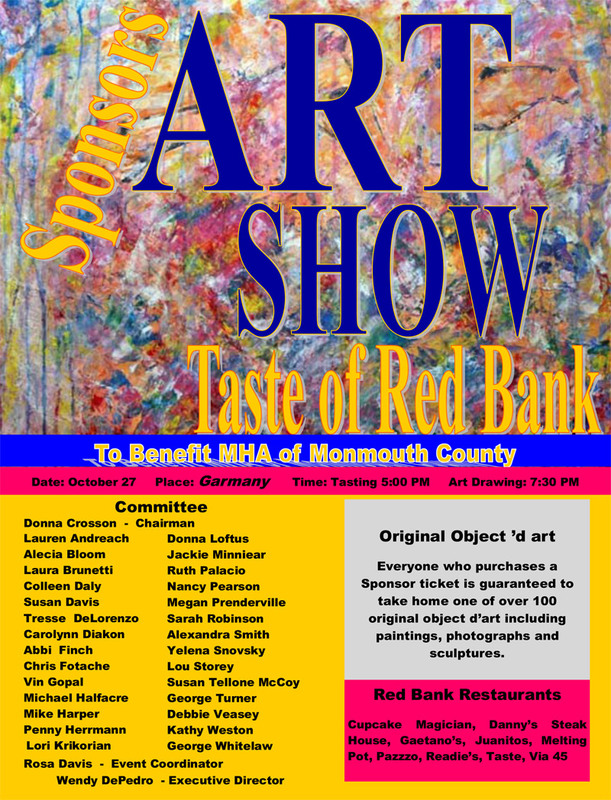 Plans are underway for the Mental Health Association‘s (MHA) Sponsors Art Show and Taste of Red Bank fundraiser to be held at Garmany in Red Bank, on Thursday, October 27th. Those with a passion for art or who are in support of the MHA’s vision of mental health and wellness will enjoy being part of this event. Starting at 5:00 PM, while taking time to preview the art, patrons will enjoy the sounds of the Andreach-Chrepta Jazz Duo while tasting and judging signature appetizers and drinks from participating restaurants and shops from Red Bank. Representing Red Bank are Buona Sera, Cupcake Magician, Danny’s Grill and Wine Bar, Gaetano’s, Juanitos, The Melting Pot, Readies Fine Foods, Taste, and Via 45. Starting at 7:30 PM sponsor ticket holders names will be randomly drawn to select in the order of which they are called, one of over 100 donated objet d’art, including framed original paintings, photographs, and sculptures. Gift Certificates are also being offered so that a friend or family member may join you as a sponsor. After all, a personally selected piece of fine art would make a wonderful gift for any occasion. Paintings may be previewed prior to the Show, at Garmany and all the participating tasting restaurants and shops, and at Red Bank Art Galleries, Frame to Please, in the Galleria, and Laurel Tracey Gallery on White Street and Weston Gallery in Manasquan. In addition, our Silver Sponsors Morgan Stanley Smith Barney will be displaying art in their Red Bank lobby. Sponsor Tickets are $250 and include an original piece of art and two tasting tickets. Tasting Tickets are also available for $25.00 each. For more information about the many rewards associated with fine art ownership and to register, call: 732-542-6422 at extension 108, on-line at www.mentalhealthmonmouth.org or mail a check to MHA, 119 Avenue at the Common, Ste 5, Shrewsbury, NJ 07702. The funds raised will benefit the programs of the Mental Health Association of Monmouth County which for over 60 years has identified gaps and made improvements to the mental health system of care for adult, youth, and their families. Its mission is to promote mental health and wellness and to advocate for quality treatment on behalf of the one in four individuals affected by mental illness at some point in their lifetime. The Mental Health Association is the leading nonprofit dedicated to helping all people live mentally healthier lives. As an affiliate of the national organization Mental Health America and the Mental Health Association of NJ, they represent a growing movement of Americans who promote mental wellness for the health and well-being of the nation-every day and in times of crisis. Their mission is accomplished through MHA’s strength based innovative programs, education, advocacy, community partnerships and shaping public policy.